We are now living in the era of fake news. If you don’t believe it, you obviously did not watch the telecast of the Academy Awards ceremony on Sunday night. The highlight (or lowlight, depending upon your perspective) of the awards ceremony came at the end of the evening when Bonnie & Clyde, a/k/a Faye Dunaway and Warren Beatty, announced that “La la Land” had won the Oscar for best picture. The director and producers and cast of La La Land came up on the stage to receive their little gold statues, and began a series of acceptance speeches. Unfortunately, the speeches were interrupted by an announcement that the previous announcement was incorrect, and that “La La Land” had not won the award for best picture, even though it had been announced that it had, and the entire cast and production crew of the movie was on the stage holding a whole bunch of the statues that they really did not win. A further announcement was then made. This announcement was that “Moonlight” had won the Oscar for best picture. Momentarily stunned by the announcement, the directors and producers and cast of Moonlight remained seated in the audience not sure what they should do. After all, the director and stars and producers of La La Land were still on the stage looking equally stunned that their acceptance speeches had been interrupted and no doubt wondering if they had to give their little gold statues back. Finally, the Moonlight folks joined the La La Land folks on the stage to the point that the stage was so crowded that the Hollywood fire marshal threatened to clear it. This incident of fake news was reminiscent of the 2015 Miss Universe Pageant in which quiz show host Steve Harvey announced that Miss Columbia had won the pageant. As it turned out, she was actually the runner up, and Miss Philippines was supposed to be announced as the Miss Universe winner. Miss Columbia was actually crowned Miss Universe, and then Steve Harvey had to come back on the stage and remove the crown from her precious head and put it on the head of Miss Philippines after admitting that the previous announcement of the winner of the pageant was in error. These would appear to be isolated incidences. However, President Donald Tweet, or rather Trump, is now telling us that we have an epidemic of “fake news,” and ironically, Democrats in Congress are agreeing with him to the extent that they claim a lot of things he is saying constitute fake news. The only thing that Republicans and Democrats seem to agree on these days is that there is a lot of fake news. The late Will Rogers once said, “All I know is what I read in the papers.” But these days what most people know appears to be based on what they see or hear on Fox News, MSNBC, or CNN, according to their perspective. 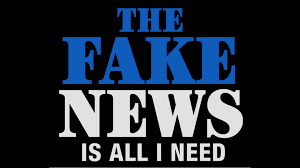 In fact, these days one doesn’t even have to read any newspaper or watch any TV news in order to get fake news. Fake news is available for all of us 24/7 through our favorite social media outlet. This raises a disturbing question. If so much news is “fake,” what can we believe? For example, did the Chicago Cubs really win the World Series last year? I actually watched game 7 on TV, but how do I know that the broadcast was real? Does anybody really believe the Chicago Cubs actually won the World Series? And what about the recent presidential election? Was Donald Trump really elected our President? The only reason we know that it happened (if it did) was that on election night, we were told by CNN and other corrupt media outlets that Mr. Trump had been elected. President Trump’s election was also reported in the New York Times and the Washington Post, two of the leading publishers of fake news, and therefore we know it probably did not happen. Make no mistake about it, we can’t believe anything anymore. But for those of us in the great state of Tennessee, this is nothing new. Tennessee has long been recognized as the state where folks believe the moon landings were fake and wrestling is real. thesis writing service UK: No words can express my gratitude! How did I happen to land here? My keywords, maybe! I wish I were able to write like this, thanks! assignment master discount code: This is true, we are living in the era of fake news, so check out "PLEASE DISREGARD THE PREVIOUS ANNOUNCEMENT" whole blog post now and get amazing updates, news about various topics as well.